DURHAM, N.C. – By harnessing the very qualities that make sickle cell disease a lethal blood disorder, a research team led by Duke Medicine and Jenomic, a private cancer research company in Carmel, Calif., has developed a way to deploy the misshapen red blood cells to fight cancer tumors. Reporting in the Jan. 9, 2013, edition of the on-line journal, PLOS ONE, the researchers describe a process of exploiting sickle-shaped red blood cells to selectively target oxygen deprived cancer tumors in mice and block the blood vessels that surround them. "Sickle cells appear to be a potent way to attack hypoxic (oxygen-starved) solid tumors, which are notable for their resistance to existing cancer chemotherapy agents and radiation," said senior author Mark W. Dewhirst, DVM, PhD, a radiation oncologist and director of Duke's Tumor Microcirculation Laboratory. "This is an exciting finding that suggests a potential new approach to fighting tumors that are currently associated with aggressive disease." "The very qualities that make sickle cells a danger to people with the inherited genetic disorder can be turned against tumors to fight cancer," said lead author David S. Terman, M.D., head of Molecular Genetics at Jenomic. "Our approach using sickle cells is a novel strategy with broad therapeutic potential that could be directed at breast cancers, prostate cancers, and many other solid tumors that develop resistance to current therapies." Sickle cells are typically associated with a potentially life-threatening disease in which red blood cells are deformed in the shape of a crescent moon or sickle. Unlike healthy red blood cells that flow smoothly through vessels, the sickle cells get stuck, causing blockages that are painful and damaging to tissue. A collaborative effort between Duke researchers and scientists from Jenomic began in 2006 to explore whether sickle cells could similarly build clots in the vast networks of blood vessels that feed oxygen-starved, or hypoxic, cancer tumors, which can grow increasingly lethal as their oxygen needs escalate. 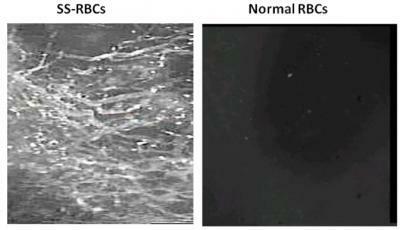 Within 20 minutes, sickle cells tagged with fluorescent dye and infused in mice accumulate in a tumor vessel and adjacent blood vessels (left panel), while normal red blood cells do not have the same effect (right panel). In a National Institutes of Health-funded study of mice with breast cancer, the researchers gave the animals an infusion of fluorescently dyed sickle cells and viewed them under special window chambers that provide real-time observation of processes inside the body. Within five minutes, the deformed cells began to adhere to the blood vessels surrounding the hypoxic tumors. Over 30 minutes, the cells had formed clots and began blocking the small blood vessels that fed the tumor. Dewhirst said the sickle cells stick like Velcro to the hypoxic tumor because it produces an abundance of adhesion molecules as part of its distress from oxygen deprivation. Normal cells don't produce the adhesion molecules, so there's nothing for the sickle cells to snag onto. "Unlike normal red blood cells, we found that sickle cells show a highly unique natural attraction to oxygen deprived tumors where they stick, cluster and plug tumor blood vessels. Once clustered within the tumor, the sickle cells deposit a toxic iron residue as they die, causing tumor cell death," Terman said. To boost that caustic effect, the researchers added zinc compounds (zinc protoporphyrin alone or in combination with doxorubicin) to the sickle cells, which caused even greater oxidative stress in the tumor and surrounding blood vessels. This resulted in a dramatic delay in tumor growth, quadrupling the amount of time the tumors were inactive compared to tumors exposed to regular blood cells. Mice showed no acute toxicity to the sickle cell treatment. "In contrast to drug treatments directed only to the hypoxic tumor cell, our approach uses the inherent qualities of sickle cells to induce injury to the tumor and the vascular micro-environment that feeds the tumor," Terman said. Dewhirst and Terman said the research team would continue to conduct studies in animals before moving to human trials.